I'm sorry, I meant to get this photographed and uploaded yesterday but it just didn't happen. Here's my winning layout that I submitted in the Picture Perfect category at my weekend scrapbook retreat. As you can tell from my layout, I'm a pretty basic scrapper. I always have been. I started scrapbooking to show off my photos and I don't get int o all the "stuff" that some scrappers put on their pages. Not that I don't admire what others do with all that "stuff", but it just isn't me. When I scrapbook and especially when I scrapbook trips I use my Deluxe Cuts color-blocking templates. I use only Stampin' Up! cardstock when I scrapbook. It just makes sense to me when there are so many great colors available. On ocassion I'll use some embellishment if it goes with the theme of my page but most of the time, it's pictures with mats, a title and journaling. It truly is what works for me! My title was cut with my favorite "tool", our Pazzles Inspiration. I wanted the title to "reflect" the picture. Many people told me that they loved the way I did the title on this layout! These were pictures that we took during our Spring Break trip to Yosemite National Park. 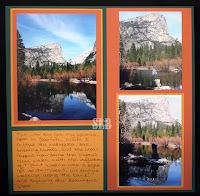 I love to use enlargements when I scrapbook especially if I have a really great photograph of a favorite place. Mirror Lake was hands down my favorite place in Yosemite. 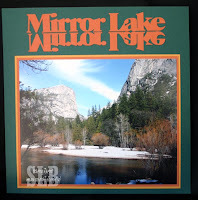 While I enjoyed everything we saw and did there, the beauty of Mirror Lake just drew me in. I'll be back tomorrow with another layout that I really enjoyed doing. I'll post some cards later on this week.